Projetex 8.5 introduces innovative file and document management solutions for productive team work. Projetex 8.5 new features are brought from the software industry's best practices. They are developed to save project managers' and translators' time and effort and fortify team collaboration within translation agencies. LocalCopy translation workflow enables project managers to easily control every edit made to the document and the author of these edits. Source information as well as all the important changes to team documents are safely kept in Projetex database and can be accessed anytime. The new Lock/Unlock system included in the workflow helps translation agency team members to signal that they are working on a document. No more time-consuming misunderstandings with the files simultaneously edited. Qweas is providing links to Projetex 8.5 as a courtesy, and makes no representations regarding Projetex or any other applications or any information related thereto. 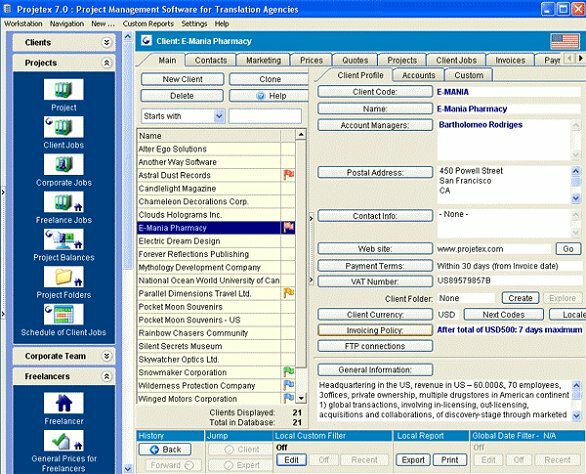 Any questions, complaints or claims regarding this application Projetex 8.5 must be directed to the appropriate software vendor. You may click the publisher link of Projetex on the top of this page to get more details about the vendor.